This summer I attended a car show hosted by the Bristol County Rod Club. 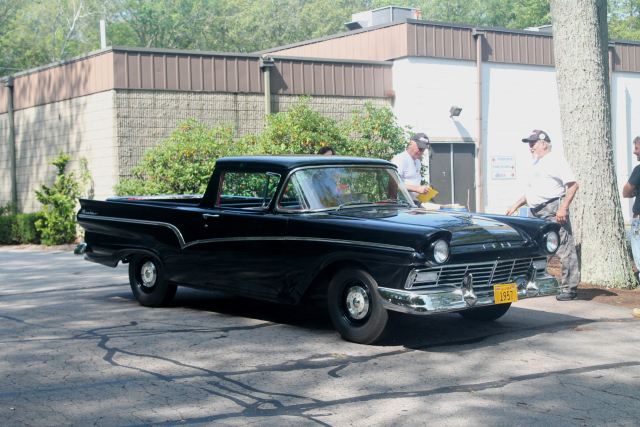 I saw lots of interesting cars, one of which was a 1957 Ford Ranchero. This was the first version of a car/truck style that continued for a few years and a couple of years later General Motors copied with their El Camino series. Of course us North Americans take a back seat to the Australians who had been driving their “utes” long before the debut of the Ford Ranchero. The Ford Ranchero was introduced in December 1956. The Ranchero was based on the standard full-sized Ford platform, specifically the 116-inch long utilitarian Courier sedan delivery Ford. The Ranchero was essentially a Courier with an open, reinforced bed, its own unique rear window and integrated cab and cargo box.